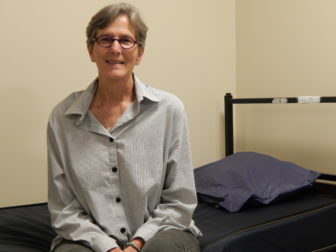 Alison Cunningham sits on a bed at Columbus House, the homeless shelter she runs in New Haven. It’s been more than two decades since Alison Cunningham joined the effort to tackle homelessness in New Haven. To say much has changed since her work began would be an understatement. As CEO of New Haven’s oldest homeless shelter for single adults, Columbus House, she led its dramatic transformation into a modern facility in her first years. The three-story, 81-bed complex that became the shelter’s new home in 2002 stands in stark contrast to its past residence – a dilapidated convent that, at times, was jammed with more than 50 beds, though it was originally meant to hold little more than half that. These days, Columbus House is one component of a larger network of partners in the Greater New Haven area. While the state’s years-long budget crisis has held back efforts addressing many societal challenges, Cunningham says state government has “ramped up” a sense of urgency on ending homelessness, which spurred the creation of transformative provider networks like New Haven’s. Now, the state is seeing meaningful results. After years of stagnation, Connecticut has significantly decreased its homeless population for three consecutive years, outpacing most other states during that time. It also has reached a handful of milestones, the most prominent of which was an effective end to veterans homelessness in 2016. Advocates fighting to bring an end to homelessness altogether say their once-seemingly unrealistic goal may at last be reachable in Connecticut, a state that not long ago was a laggard nationally but has emerged as a model. Cunningham and others credit a governor who made ending homelessness – not just managing it – a priority of his administration. While homelessness will never disappear completely, advocates say, an “end” to homelessness means it is rare, brief and non-recurring. Gov. Dannel P. Malloy’s push to coordinate efforts between service providers and make more resources available has had a “huge” impact both at Columbus House and across the state, Cunningham said. Homelessness is just one piece of a puzzle that he said includes addressing educational access and opportunity, investment in cities, crime and transportation. The numbers, while promising, hardly mean Connecticut has solved the challenge of homelessness. Thousands of children and adults remain homeless, and the existing service structure could slip back into inadequacy, advocates say. Furthermore, although wide-reaching changes have been made to improve coordination among providers and with the state, Connecticut doesn’t have enough affordable housing units to support many low-income individuals and families who are homeless now or remain at risk. This year’s point-in-time count, conducted by the Connecticut Coalition to End Homelessness on Jan. 24, found that homelessness is down 24 percent from three years ago, and has decreased 27 percent from the survey’s all-time high in 2008. While the national data for this year’s survey will not become available until later in the year, Connecticut has outpaced the national average in each of the last two years and appears poised to do so again with a 13 percent decline in 2017. This is a major shift for a state that until recently had not been keeping pace with the rest of the country, which has seen homelessness decline in all but one year since the national point-in-time count began in 2007. More telling, perhaps, is the contrast between Connecticut and two of its neighbors – New York and Massachusetts. The national data available through 2016 show that since 2010 – the one year homelessness increased nationwide in the survey – Connecticut’s homeless population has decreased by 9.6 percent while New York’s has increased by 31.6 percent and Massachusetts’ by 17.8 percent. Progress in Connecticut has come at a relatively modest cost to the state, which has a $20 billion annual budget. The state’s homelessness initiatives cost about $105 million annually, with the federal government providing more than half of that – about $60.3 million. The state allocates the remaining $44.7 million. The total budget for these initiatives has increased by more than 20 percent since Malloy took office. The state now receives about $10.4 million more in federal funding each year, and annually devotes $12.5 million more in state dollars. Homelessness initiatives are only one side of the equation, however. Affordable housing is the other. Connecticut’s shortage of affordable housing, particularly in suburban and rural towns, remains the largest challenge to ending homelessness. There is a “fragility” that comes with putting people experiencing homelessness into Connecticut’s expensive housing market, said Lisa Tepper Bates, executive director of the Connecticut Coalition to End Homelessness. “We need the housing that our workforce can afford, given the jobs that are available to them,” she said. Private investment in affordable housing, Malloy said, has been the primary driver of the progress that has been made thus far. The Housing Department estimates the private sector has invested $2 billion in new affordable housing developments since 2013 – though that total includes mixed-income and mixed-use developments, which also can contain market-rate units and storefronts. The state has played a role as well. In each year since 2013, the Connecticut Housing Finance Authority has committed between $170 million and $200 million in bonds to make grants or loans for affordable housing development, according to state Housing Commissioner Evonne Klein. Malloy is not shy about pointing to what he says was a lack of commitment to affordable housing from his three predecessors – Govs. Lowell P. Weicker, John G. Rowland and M. Jodi Rell. 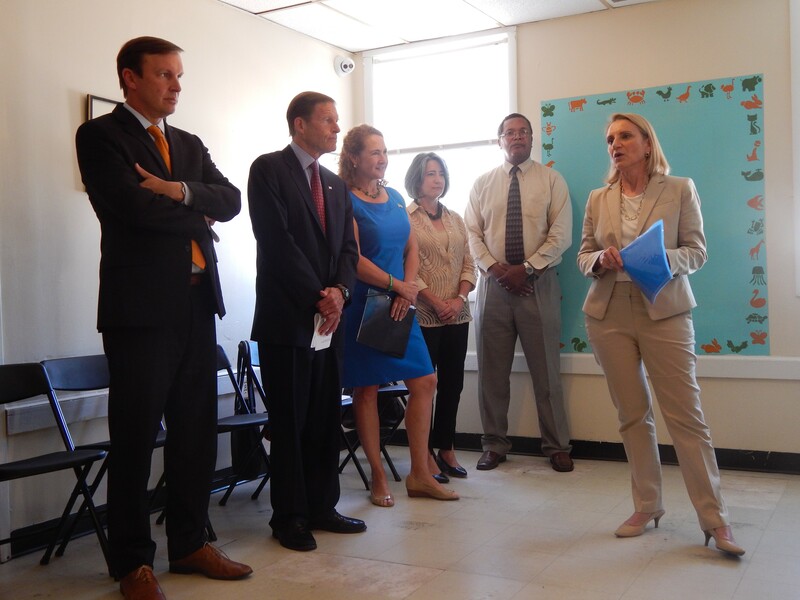 Housing Commissioner Evonne Klein, right, speaks at a homeless shelter in Waterbury last year. She is joined by three members of Connecticut’s congressional delegation. Klein said the state has contributed to the completion of nearly 10,000 new affordable units since Malloy took office in 2011, with 5,000 more on the way. Those additions would bring Connecticut’s total to roughly 20,000 affordable units, she added. Making this investment up front, Klein said, saves the state money in the long run. A University of Connecticut study found that an individual experiencing homelessness costs the state about $33,000 each year, while a family without a home costs about $120,000 each year. Those costs can come from things like emergency room visits paid for by the state’s Medicaid allotment, or the expenses of incarceration in a correctional facility. In comparison, providing a housing voucher to an individual experiencing homelessness costs $15,000, the study said. For a family, the voucher would be $20,000. Klein said providing housing creates savings for the state and for hospitals, which also incur costs serving the homeless. Philanthropic funding also has played a key role in the state’s progress on homelessness. 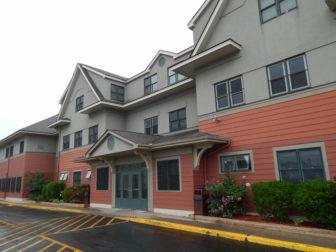 The Melville Charitable Trust, the largest private funder of efforts to combat homelessness in Connecticut, began investing in supportive housing as early as the 1990s, said Janice Elliott, the trust’s executive director. Melville has since expanded its mission beyond supportive housing. Elliott said it spends between $3 million and $3.5 million on fighting homelessness in Connecticut each year. Local foundations and other charitable groups chip in about that much combined, Elliott estimates, bringing the private spending total to $7 million in a good year. President Barack Obama laid out goals and principles at the federal level in his 2010 Opening Doors initiative, which became Connecticut’s blueprint for tackling homelessness. Opening Doors designated several groups in the homeless population as priorities – veterans, the chronically homeless, families and youths. This initiative was paired with another federal action, the HEARTH Act, which established coordination and data collection requirements for states receiving some federal dollars to combat homelessness. More federal funds became available to states that adopted the same goals. Malloy was one of the first governors to sign on. The state’s longstanding public-private partnerships on homelessness played a crucial role in the implementing the strategy. 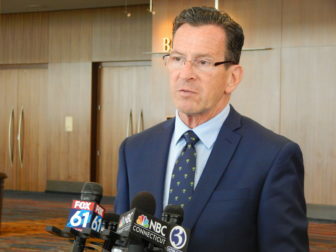 Those various partnerships had begun taking shape years before Malloy took office, but advocates give the governor credit for bringing all of those partners to the same table when he created a mirror image of Obama’s initiative at the state level in 2012 – Opening Doors Connecticut. “It’s been a total game-changer for our state in accelerating our pace and getting us to this next level that we’re now at,” Woodsby said. To implement the priorities and coordinate efforts, Malloy created a new state agency – the Department of Housing, which opened its doors in 2013. It brought together programs previously supervised separately by the Department of Social Services, Department of Economic and Community Development, Department of Mental Health and Addiction Services and the Office of Policy and Management. Malloy has repeatedly pointed to the department as a symbol of efficient governance in difficult budgetary times. It employs just 23 people, making it one of the smallest in state government. Yet advocates say the work it does is invaluable – especially in the area of statewide digital record-keeping and data-sharing. Opening Doors also created a 50-member, public-private steering committee under the Partnership for Strong Communities, with representatives from numerous groups as well as the Department of Housing. This group sets the agenda for the statewide effort. What also emerged from the initiative is a new “front door” for Connecticut’s homeless services – coordinated access networks, or CANs. There are eight CANs in different regions of the state, each coordinating the work of a number of different providers – shelter, prevention, rapid rehousing, transitional housing and permanent supportive housing. 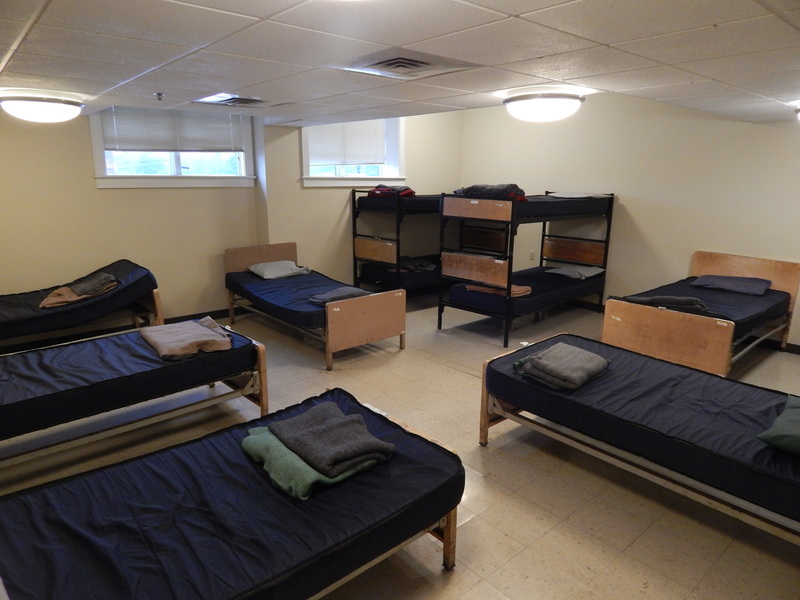 Columbus House, an 81-bed homeless shelter in New Haven, on a rainy day last week. Tepper Bates said the networks, now three years old, have eliminated duplication of effort, put providers in teams and created a vehicle for conducting targeted homelessness campaigns – such as a 100-day challenge or the Zero 2016 initiative. “We shifted from this disjoined system of shelters to a regional approach,” Woodsby said. Columbus House, for instance, is a member of the Greater New Haven CAN. Any homeless person in the New Haven area can call the 2-1-1 hotline, operated by the United Way, to set up an appointment to find out when a shelter bed will become available. Depending on the person’s background – veteran or non-veteran, for example – the wait time could be shorter or longer. The most impoverished people may qualify for rapid re-housing and eventual placement in permanent housing. A drug addict could qualify for supportive housing. The system is more efficient, in part, because a homeless person can be referred to the appropriate services up front rather than going from one provider to the next. 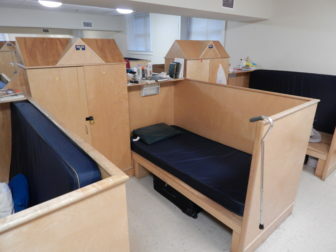 Once placed in a shelter like Columbus House, Cunningham said, the goal is for the average person to spend 60 to 90 days there, though some who only need shelter for a brief period tend to exit within days of receiving a bed. For those who stay, they have the guarantee of stable housing and access to health and career services to help them chart a path to a job, if necessary, and housing. More realistically, though, it can take 120 days or, sometimes even longer, depending on the case, Cunningham said. Whether the progress will continue is a question officials and advocates say will be decided by state and federal budgetary decisions. The state is currently weighing its options for closing a $5.1 billion budget gap over the next two years, while President Donald J. Trump is exploring cuts to federal grants the state Department of Housing relies on. A room full of temporary beds at Columbus House, where people experiencing homelessness spend their first days after arriving in the facility. In spite of these challenges, Malloy said he remains focused on his goal of ending chronic homelessness before the end of his term. Individuals with a disabling condition who have been continuously homeless for a year or more, or have had at least four episodes of homelessness within three years, are considered “chronically” homeless. Last year, the state matched all known people experiencing chronic homelessness to housing, but fell short of meeting the U.S. Department of Housing and Urban Development’s definition for ending it. Existing cuts already threaten the governor’s goal. This year’s point-in-time count, Woodsby said, showed a small slip among veterans and the chronically homeless. Advocates say Connecticut may well be standing on a precipice, where one false step from the state or federal government could undo much of the progress that has been made. If the cuts go any deeper, they say, not only will chronic homelessness remain, homelessness will begin to climb again. People living in Columbus House are assigned long-term beds as they become available. They offer a degree of privacy and storage space for personal items. Progress on affordable housing, already slow, could slow even more in the state’s suburban and rural communities if Malloy signs a bill to loosen affordable housing development standards – or if his potential veto is overridden by the same bipartisan majorities that passed the legislation. Advocates of the bill say the existing affordable housing standard under the state’s 8-30g law – which pushes, but does not require, all municipalities to have 10 percent of their housing stock deemed affordable – is unrealistic for many communities and causes more harm than good. Tepper Bates, however, said it “would further the divide” between affordable development in urban centers and their surrounding communities. “I don’t know what the hell people are thinking about” with this proposal, Malloy said while discussing the House’s passage of the bill earlier this month.